The chapel alter at the Palais Lascaris Museum in Nice, France in Europe has many historic pieces displayed for viewing. A chapel alter adorned in golden colors displaying antique pieces of art from the 17th and 18th centuries at the Palais Lascaris Museum in Nice, France in Europe. Chapel alters nowadays could never compare to the elegance and decor of this chapel in the museum in Nice, France. Book an tour through the Palais Lascaris Museum in Nice and explore the different rooms and see what life had to offer centuries ago.Chapel Alter in the Palais Lascaris, Museum, Old Town, Nice, Provence, Cote d'Azur, France, Europe. 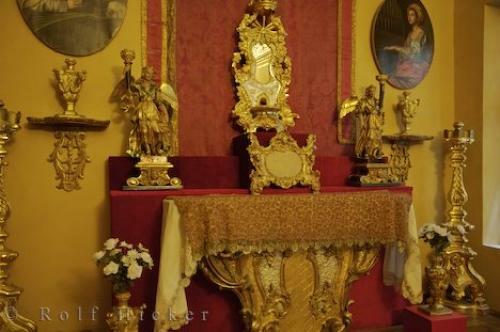 Photo of a chapel alter at the Palais Lascaris Museum in Nice, France in Europe.